There is a widespread belief that Cross Media and Transmedia techniques are similar, but nothing further from reality. While Cross Media refers to the process that revolves around storytelling through different platforms and thanks to it the story makes sense; Transmedia gets a differentiating element: the platforms are independent and do not need access to all content for understanding the story. But what is Transmedia? We could define it as a narrative process of a brand that intentionally decides to divide its content across multiple platforms or channels to arouse curiosity and interest of the user. However, despite being from different fragments housed in various media, the viewer can understand the story just watching one of them and then decide whether to consume other content and in which order. Thus, this technique is ideal to connect and interact with users and can be used in sites, television, social networks and even in video games or books. However, to ensure good effectiveness is required a good strategy that includes creating a unique experience to the consumer who will encourage him to participate and be involved in the content creation. Storytelling and Branded Content are the "trending topic" of the moment, the ying and yang that harmonize and complement the brand new content. To get interest and loyalty of users, they first have to captivate and so the best technique to achieve it is to combine storytelling (telling a story that excites and empathizes) and branded content (providing new, more interactive and less intrusive creative formats). This merger will get a much stronger emotional bond that also will build trust. It is thanks to the storytelling the user feels part of a story and is much more responsive and proactive, a key fact that helps the advertiser to get closer to their followers and thus make him able to offer a personalized experience. However, this requires understanding the motivations of consumers very well and adapt the brand and link to content provided with an emotional incentive and not rational one. Branded Content alone can be and can get very good results but if this is added a good story that encompasses the feelings of the user and the values of the brand, we will be infront of an invincible content. And what is more important, to ensure success we always need to keep in mind at all times, the point of view of the consumer and coherence between creativity and philosophy and brand values. 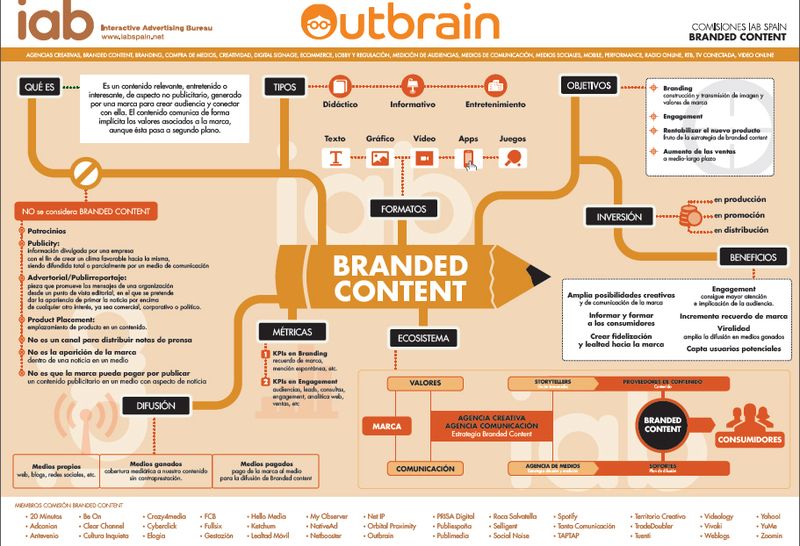 Having a story to explain is the initial phase of any Branded Content. Brands want to connect with their users but the question is, how to reach them in an effective way and with which they would feel comfortable, participant and interested? Branded Content has evolved so that today is much more than to present an entertaining content to be consumed: it is an alive content that contains values and shared emotions. An alternative increasingly common for both large and small advertisers, since the key is not in the investment or the cost but on the creativity and on the skill to hit and empathize with the public. Everything revolves around the experience to not to sell as the main objective, but entertain and generate sales on long medium - term. The main thing is the public generates a positive image of the brand that will generate confidence and will be placed in their top of mind with different contents that appeal and move to consume and share. Sharing is another "must" Branded Content, because good content must lead his own viralización to reach its audience and contribute to its success and gaining notoriety transmiting values. And there is no right way, the Branded Content may include any content and take multiple formats, so its effectiveness lies with good adhesion by the public. Branded Content was created to respond to all those users looking for entertaining and useful content that do not bother them or are considered as intrusive. A new trend that involves the creation and funding of a content of a brand that can take different formats: from a video, a blog or a message on social networks. Effectiveness and low cost are the main advantages why every day more advertisers are encouraged to opt for a more consumer-friendly advertising. Users leverage any time to drop, so Branded Content has become the perfect formula to encourage them to consume content that may be of their interest appealing the emotional fact. One of the best techniques to achieve medium-term benefits that also contributes to the reputation and brand positioning, facts that influence to create engagement with the user . Another aspect which positions the Branded Content as a method that will supplant the current advertising is its quality and its use in transmedia strategies. It is usually personalized content that is designed exclusively for a specific audience that gives them added value. Definitely it is part of creating an entertainment experience that favors the message and the story, leaving benefits apart or attributes of a product or service.